Milwaukee 49-94-3173 Alum. Oxide Grinding Wheel 7 x 1/4 x 7/8 in. Arbor. 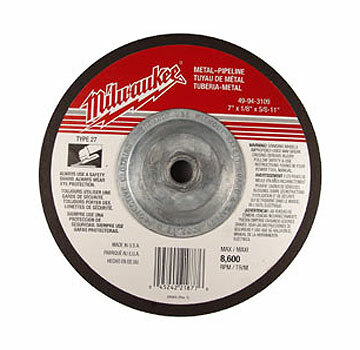 PRODUCT: MILWAUKEE 49-94-3173 ALUMINUM OXIDE GRINDING WHEEL, 7 INCH OD X 1/4 INCH THICK. 7/8 INCH ARBOR HOLE. TYPE 27 WITH DEPRESSED CENTER. PRICE/EACH. DECRIPTION: Type 27 Depressed Center Aluminum Oxide Grinding wheels are strong and tough. Reinforced with fiberglass they resist breaking from twisting, starting torque and lateral pressures. They can be used in the toughest metal grinding applications such as grinding down weld seams and bumper work. Grit configuration is ideal for long life of the wheel. With a 7/8 inch arbor hole, this grinding wheel must use a Hub Adapter - 48-03-1000, Nylon Washer 45-88-8465, a Flange 49-05-0060 and disc nut 49-40-0380 to attach to the grinder properly.